--- (3.05.2018) - 28 Internationale Briefmarken Messe Essen (28th Essen International stamp fair). First day pictorial 'Essen' card with the two ATM special issues of the fair, one Spain ATM (Tarifa A) and one of Guernsey (GY Letter up to 100g). Postmarks of both postal administrations - see picture. --- (3.05.2018) - 28 Internationale Briefmarken Messe Essen (28th Essen International stamp fair). Code P5DE18 ES18 (Printer installed at the Essen's fair). Special imprint ' 3-5 mayo Essen '. Mint ATM, domestic mail (Tarifa A). --- (3.05.2018) - 28 Internationale Briefmarken Messe Essen (28th Essen International stamp fair). Code P5DE18 ES18 (Printer installed at the Essen's fair). Special imprint ' 3-5 mayo Essen '. Mint ATM, domestic mail (Tarifa A) + first day of issue receipt. --- (3.05.2018) - 28 Internationale Briefmarken Messe Essen (28th Essen International stamp fair). Code P5DE18 ES18 (Printer installed at the Essen's fair). Special imprint ' 3-5 mayo Essen '. Strip with two ATMs, domestic mail (Tarifa A), with the first day special fair postmark. --- (3.05.2018) - 28 Internationale Briefmarken Messe Essen (28th Essen International stamp fair). Code P5DE18 ES18 (Printer installed at the Essen's fair). Special imprint ' 3-5 mayo Essen '. Mint strip of four ATMs, domestic mail (4 x Tarifa A) + first day receipt. --- (3.05.2018) - 28 Internationale Briefmarken Messe Essen (28th Essen International stamp fair). Code P5DE18 ES18 (Printer installed at the Essen's fair). Special imprint ' 3-5 mayo Essen '. First day pictorial card, domestic mail (Tarifa A). First day special fair postmark. --- (3.05.2018) - 28 Internationale Briefmarken Messe Essen (28th Essen International stamp fair). Code P5DE18 ES18 (Printer installed at the Essen's fair). Special imprint ' 3-5 mayo Essen '. First day pictorial 'Essen' card with the four-values set (Tarifa A - A2 - B - C) + first day receipt. --- (3.05.2018) - 28 Internationale Briefmarken Messe Essen (28th Essen International stamp fair). Code P5DE18 ES18 (Printer installed at the Essen's fair). Special imprint ' 3-5 mayo Essen '. Catalogue of the stamp fair with ATM, domestic mail (Tarifa A). First day special fair postmark. --- (3.05.2018) - 28 Internationale Briefmarken Messe Essen (28th Essen International stamp fair). Code P5DE18 ES18 (Printer installed at the Essen's fair). Special imprint ' 3-5 mayo Essen '. First day cover, domestic mail (Tarifa A). First day special fair postmark. --- (3.05.2018) - 28 Internationale Briefmarken Messe Essen (28th Essen International stamp fair). Code P5DE18 ES18 (Printer installed at the Essen's fair). Special imprint ' 3-5 mayo Essen '. First day cover with the four-values set (Tarifa A - A2 - B - C) + first day receipt. --- (3.05.2018) - 28 Internationale Briefmarken Messe Essen (28th Essen International stamp fair). Code P5DE18 ES18 (Printer installed at the Essen's fair). Special imprint ' 3-5 mayo Essen '. First day cover mailed to Spain (Tarifa A). First day special fair postmark. --- (3.05.2018) - 28 Internationale Briefmarken Messe Essen (28th Essen International stamp fair). Code P5DE18 ES18 (Printer installed at the Essen's fair). Special imprint ' 3-5 mayo Essen '. Set of four first day covers mailed to different countries (Tarifa A - A2 - B - C) + first day receipt. --- (3.05.2018) - 28 Internationale Briefmarken Messe Essen (28th Essen International stamp fair). Code P5DE18 ES18 (Printer installed at the Essen's fair). Special imprint ' 3-5 mayo Essen '. Maximum card, domestic mail (Tarifa A). First day special fair postmark. --- (3.05.2018) - 28 Internationale Briefmarken Messe Essen (28th Essen International stamp fair). Code P5DE18 ES18 (Printer installed at the Essen's fair). Special imprint ' 3-5 mayo Essen '. Mint strip with the four-values set (Tarifa A - A2 - B - C) + first day receipt. --- (3.05.2018) - 28 Internationale Briefmarken Messe Essen (28th Essen International stamp fair). Code P5ES18 CH18 (Philatelic service printer). Special imprint ' 3-5 mayo Essen '. Mint ATM, domestic mail (Tarifa A). --- (3.05.2018) - 28 Internationale Briefmarken Messe Essen (28th Essen International stamp fair). Code P5ES18 CH18 (Philatelic service printer). Special imprint ' 3-5 mayo Essen '. 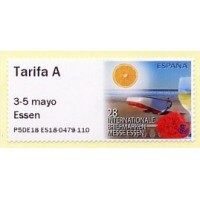 Essen pictorial first day card with the four-values set (Tarifa A - A2 - B - C). First day date postmark Madrid & special fair postmark. --- (3.05.2018) - 28 Internationale Briefmarken Messe Essen (28th Essen International stamp fair). Code P5ES18 CH18 (Philatelic service printer). Special imprint ' 3-5 mayo Essen '. First day cover, domestic mail (Tarifa A). First day date postmark 'Madrid', and special fair postmark. --- (3.05.2018) - 28 Internationale Briefmarken Messe Essen (28th Essen International stamp fair). Code P5ES18 CH18 (Philatelic service printer). Special imprint ' 3-5 mayo Essen '. First day cover mailed to Spain (Tarifa A). First day date postmark 'Madrid'. --- (3.05.2018) - 28 Internationale Briefmarken Messe Essen (28th Essen International stamp fair). Code P5ES18 CH18 (Philatelic service printer). Special imprint ' 3-5 mayo Essen '. Maximum card, domestic mail (Tarifa A). Special fair first day postmark. --- (3.05.2018) - 28 Internationale Briefmarken Messe Essen (28th Essen International stamp fair). Code P5ES18 CH18 (Philatelic service printer). Special imprint ' 3-5 mayo Essen '. Mint strip with the four-values set (Tarifa A - A2 - B - C).